Jenny North, seventeen in 1967, loses her stepmother, not through carelessness but because she, Margaret of the title, walked out. For fifteen years Jenny vacillates between desperately seeking Margaret and trying to get her out of her life altogether. Events of the shadowy period following the second world war and misunderstandings about relationships are involved. Revealing too much more plot would be a spoiler. 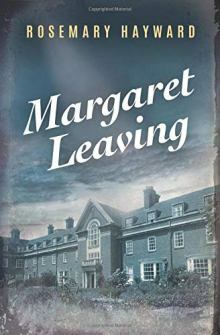 Why did Margaret Leave? This is a mystery, after all. Jenny has three good friends who stand by this rather prickly, self absorbed history student in her struggle to come to terms with the fact of Margaret. Read the book to get to meet Bev, Emily and Alan. Why they want Jenny as a friend might be one of the questions you ask yourself. She's not your everyday hero with a problem to solve. If you like asking yourself questions as you read, like history, and like a plot where every twist counts, then this is a book for you. Margaret Leaving started out when I had a year living in California, husband working, children in school and me unable to work due to visa restrictions. Could I devise a plot, invent characters, make a whole world out of words? A year later I had a creation I called Present Imperfect. Fast forward five years and I'm back in California, waiting out my greencard application and I mention to someone I've met that I've written this book. "Come to this writers' conference with me." One of the best times ever. Other writers took my work seriously; commented on it as if it was real. I soon realized I didn't have a book. I had the first draft of a book. Five years, and a lot of learning, later I had Margaret Leaving.